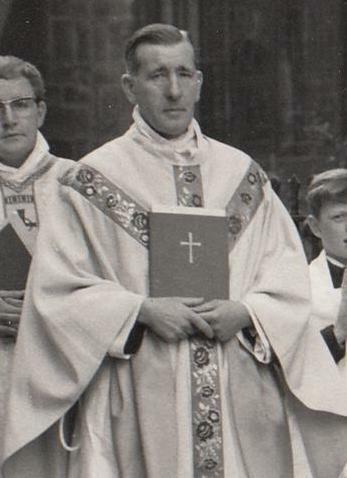 ​We also remember today Fr James Myerscough who died 26 years ago, does anybody remember him? James Myerscough was born 24 May 1910 and was ordained 23 July 1934, he spent the first 17 years of his ministry on the Missions in the Gold Coast, Africa, returning to England in 1956 he came on loan to the Salford Diocese and spent four years as a supply priest at the Cathedral, Longridge, Flixton and Blackley, he incardinated into the Salford Diocese in April 1960 then served as curate at St Gabriel, Castleton until 1963 and at St Mary, Burnley until 1971. In 1971 suffering from ill health, Fr Myerscough became chaplain to Bury Convent, in 1983 he retired to McAuley Mount where he died 28 May 1992.